The Hawkeyes are doing very well for themselves with their new Marvel Now! series. Kate Bishop’s new series had an exceptional debut this week, and while she takes the reins of the Hawkeye solo title, her predecessor Clint Barton is at the center of Occupy Avengers, a new team book from writer David F. Walker and artist Carlos Pacheco. Last month’s first issue of Occupy Avengers revealed Walker’s firm handle on Clint Barton’s everyman voice, and Clint’s socially conscious mission is going national as he helps struggling Americans that aren’t on the radar of other superheroes. That mission has taken Clint to New Mexico’s Sweet Medicine Indian Reservation, where locals are dealing with a contaminated water supply. The time-displaced Native American hero, Red Wolf, came to Clint’s rescue when an armed militia attacked him, but that was just the precursor to a much deadlier, wetter menace: Hydro-Man. This preview of Occupy Avengers #2 has Red Wolf stepping into the narrator role, providing a concise summary of his origin as he resigns himself to death by drowning. 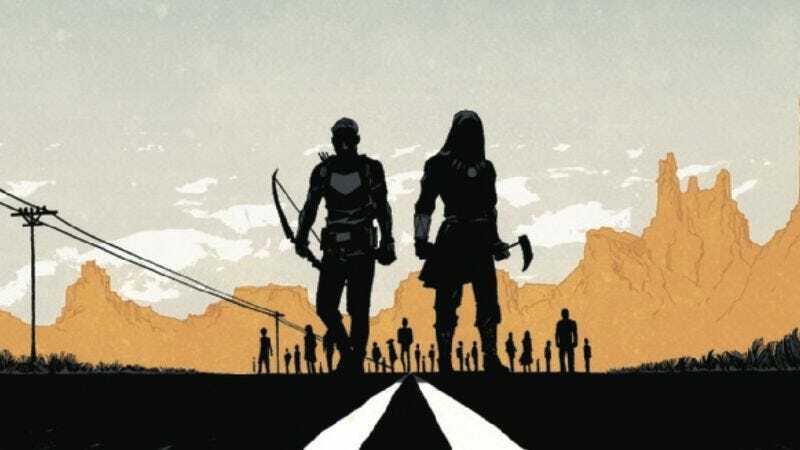 Red Wolf’s new life is flashing before his eyes, allowing Walker the opportunity to give readers the low-down on this modern interpretation of Marvel’s indigenous superhero. Carlos Pacheco, inker Rafael Fonteriz, and colorist Sonia Oback deliver crisply detailed, dramatically composed artwork, and they condense a considerable amount of visual information in the opening page to give readers a strong impression of Red Wolf’s present-day journey. Pacheco makes smart use of the water level in the big shot of Hydro-Man drowning the heroes, using it like a panel border to create a sense of motion between Hawkeye punching Hydro-Man up top and Red Wolf sinking below. Occupy Avengers may have a dusty title, but it’s offering a fresh take on the Avengers concept, with a down-to-earth approach to the team that tackles major social issues while still delivering superhero excitement.